Elise Webb starting doing shortform improv when she was a mere tyke. At 18, she moved to Chicago, where she fell in love with longform. She spent several years studying in Chicago, where she was on a team with pH Productions as well as other Harold teams. 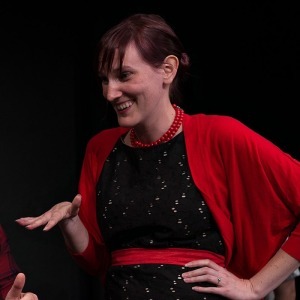 Elise stumbled onto WIT after a five-year break from improv, during which time she worked as a Pilgrim from 9 to 5 in Plymouth, Massachusetts and spent time in Rwanda (where her flailing white-girl moves won her a dance contest). She went on to perform with WIT Harold Team Spirit Bear, and is now thrilled to be playing with this magnificent people on King Bee. I thought I had X-ray vision because I could see between the slats on privacy fences.